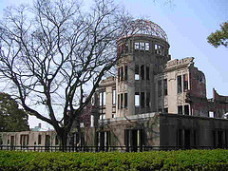 The ruin known as 'Genbaku Dome (Bomb Dome) used to be the the Hiroshima Prefectural Commercial Exhibition Hall which was constructed in 1915 as a base for promoting the sale of goods produced in Hiroshima Prefecture. It was also used as an art exhibition hall. The building designed by Czech architect Jan Letzel was mixed style of Neo-baloque and Art-nouveau. 0.2 second after the explosion, the building was covered by the fierce heat ray and 0.8 second later, strong blast, like shock wave, attacked. So the Dome seemed to be destroyed momentaly even less than 1 second. The body of the three-storied building was almost fully-destroyed but only the dome part remained. As the year rolled by, they started to call this building 'Genbaku Dome' and became a symbol for appealing the abolition of the nuclear weapon and lasting peace to the world. Then it was registered as world heritage in December 1996. On the west side of the Dome, there is Aioi Bridge which was said to be the target of the bomb. 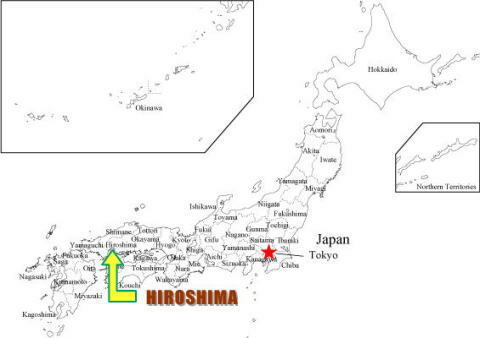 On the south side across the Motoyasu River, there is Hiroshima Peace Memorial Park.